The long, long-awaited biopic of Queen frontman Freddie Mercury is coming closer. Now called Bohemian Rhapsody, the controversial film was originally to have Ali G star Sacha Baron Cohen in the lead role. He left the project in 2013 amid reports of creative differences with surviving Queen members Brian May and Roger Taylor. The duo have insisted that Cohen’s reputation as a comedian and prankster would be “distracting” for moviegoers, though he has suggested that they wanted a “less interesting” movie that protected the Queen legacy. 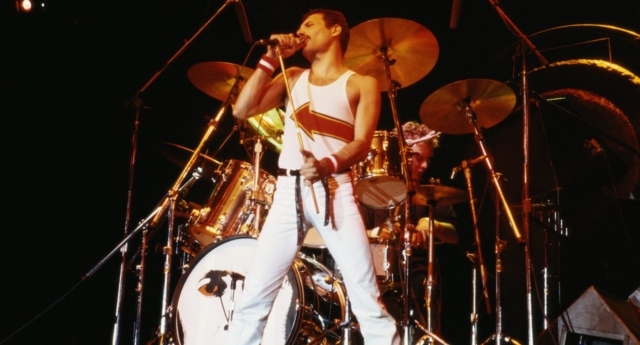 With the final scenes said to be set at Live Aid, it appears as though Mercury’s battle with HIV/AIDS will not feature in the film. James Bond actor Ben Wishaw was in the frame to replace Cohen, but he also pulled out after the film stalled due to script issues. Mr Robot star Rami Malek signed on almost a year ago, and X-Men and The Usual Suspects director Bryan Singer also joined the project. Fans got their first glimpse of Malek as Freddie when a glossy press shot was released last month, but director Singer has now teased some shots directly from the set. “Couldn’t help myself and had to post this iPhone pic,” Singer said with the candid snap of Malek as Mercury. He also shared a photograph of Brian May photographing Gwilym Lee, who is playing him in the movie. He had previously posted a wide shot from the set, quoting Queens 1977 hit ‘We Are The Champions’. “‘You’ve given me a fame and fortune and everything that goes with it, and I thank you all! But it’s been no bed of roses…no pleasure cruise…'” he had previously quipped with another shot from the set.